Do I have a say in where vehicle gets repaired, even if my insurance company suggests that I use their preferred location? Yes, according to Connecticut State law you have the right to have your vehicle repaired at the licensed repair shop of your choice. Your insurance company cannot require you to go to a particular shop. Choose a repair center that has the proper repair equipment and certified technicians (i.e I-CAR). Breezy Point Auto Body is an I-Car Gold Class collision repair facility and all our technicians have continuing I-CAR training to ensure that they are trained in the latest repair process and equipment. 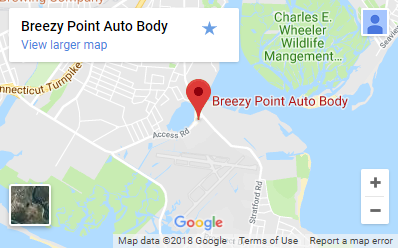 Breezy Point Auto Body is also OEM Certified for Honda, Acura, Nissan and Infiniti models, and recognized by Hyundai, Ford and FCA (Chrysler-Fiat). Why are some estimates different? Differences in repair estimates are common. A lower estimate may not include all necessary work. If you’re not sure why one estimate is different from another you’ve received, just ask one of our friendly staff members. Do I have to go to the drive-in claims center? Some insurance companies may want you to visit their drive-in claims center before having your car repaired. You do not need to do this. You may leave your car at our facility and we will have the insurance company inspect the car at our location. Breezy Point Auto Body works with all of the major insurance companies and we keep close communication with you and your insurance company to advise of all work and repairs that need to be done to your vehicle. Most insurance policies include rental. If yours does not, we have discounted rates that we can pass along to you. If you are a claimant, by law, you are entitled to a rental. At Breezy Point Auto Body, we are happy to coordinate the entire process through Enterprise. Find and follow us on your favorite social media platforms, including Facebook, Twitter, and Google+. We will keep you posted on the latest promotions, services, and events going on at Breezy Point Auto Body, so make sure to connect with us. Years ago, before being green was “the thing to do in the industry,” Breezy Point Auto Repair converted our systems to energy efficient equipment. We installed energy efficient systems like electronic spray booths and intelligent air compressors, not because it was “the thing to do”, we did it for our planet. Even our supplies are waterborne. Determine if there are any injuries. Call 911 immediately to report the accident and get help to the scene, if needed. The best-selling car of all time is the Toyota Corolla, with over 30 million sales since 2009. One Corolla is sold every 40 seconds around the world. The staff is always friendly and accommodating, and work is top notch. I have always had a great experience in my dealings with them. Can't say enough about these guys they're great. Tom and Paul went out of their way and bent over backwards to provide me an exceptional experience in a very traumatic situation after being hit by a deer. They are well worth the drive if you don't live nearby.